This delicious libation is made at the peak of apple harvest, which is usually September until mid-November. The pure apple juice is fermented naturally (it doesn't need any kind of yeast or starter) in big oak fermenting tanks for 7-30 days until all of the sugar has been fermented into alcohol. The juice is then sent to the still where the distillation boosts the proof to about 160, where it ensures the maximum flavor and aroma. After this, the apple brandy is cut with water and aged in oak barrels for 4-8 years. Applejack tends to be made with a younger blend of this brandy (about 4-6 years). Libations left over: About half the bottle, so serve with dinner or have a glass while the stew is simmering. It was a gloomy, slightly chilly weekend by the ocean in Santa Monica, and that kind of weather gets me in the mood for hearty soups overloaded with seafood. 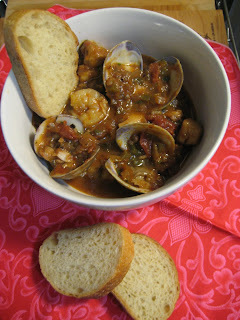 One of my favorite seafood stews is Cioppino, which sounds like an Italian dish, but actually hails from San Francisco. It was developed in the late 1800s by Portuguese and Italian fishermen in the north bay of San Fran and they would actually made it on their boats. This particular recipe from Gourmet doesn't require you to whip up some stew on a dinghy, but you can get creative. I've had this dish served with king crab, squid, mussels, and other kinds of fish, so just add whatever seafood you like. As always, I got my catch of the day from Santa Monica Seafood, because as much as I would like to spend all morning casting my net out to sea, this Lush Chef has other things to do. - Cook garlic, onions, bay leaf, oregano, red pepper flakes, salt and pepper in olive oil in an 8 quart heavy pot over medium heat, stirring until onions are softened (about 5 min). - Add bell pepper and tomato paste, stirring for about 1 minute. - Add wine and boil until reduced by about half (5-6 min). - Add tomatoes with their juice, clam juice and chicken broth and simmer covered for about 30 minutes. - While stew is simmering, hack crab leg through shell into 2-3 inch pieces. - Add crab pieces and clams to stew and simmer covered, until clams just open (5-10 min), checking every minute after 5 minutes to transfer opened clams to a bowl with tongs or a slotted spoon. Discard any unopened clams after 10 minutes. - Lightly season fish fillets, shrimp and scallops with salt and pepper and add to stew, simmer covered until just cooked through (about 5 min). - Discard bay leaf and return clams to pot. 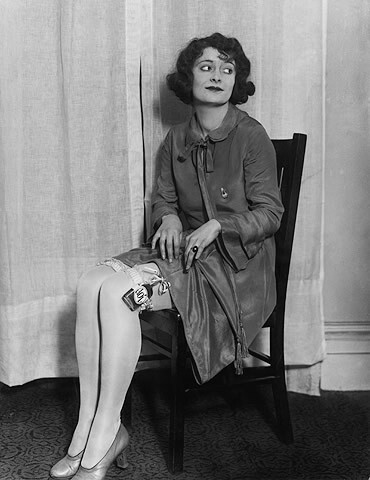 - Gently stir in parsley and basil. - Serve with focaccia or sourdough bread rounds. 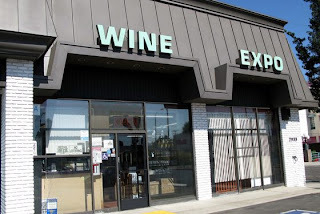 Last week, the Lush Chef told you about her visit to Silver Lake Wine, but if you're a Westsider like me, sometimes you just want to be closer to home for a wine tasting. Enter Wine Expo in Santa Monica! I must have passed by this place a gazillion times on Santa Monica Blvd and I never thought to stop in. I thought it was just a little wine shop like the ones in my neighborhood and boy, was I wrong. A friend, let's give him the code name "American Trilogy," (cocktail recipe coming soon) introduced me to this spot because it's just down the street from him. They recently built out a beautiful tasting room along the side of the shop. The front part has a little art gallery-like space, but hidden in the back is a huge room with a nice, long bar, plenty of cocktail tables and seating, and even a small private room. We went on a Saturday when they were doing their 20/20 special (they're doing 1 more Saturday in September). Yes, that's 20 wines for $20. American Trilogy and I knew we couldn't each drink 20 wines (there was only 1 guy in the tasting room that hit 20), so we split it and each did the same 10 wines so we could go through a flight together. They change up the choices every week and break the tasting up into bubblies, pinks, whites and reds. We only made it to wine 7 or 8 because the pours were quite generous. Sangria and beer is also on tap, and they have a nice selection of salumi, cheese, olives, nuts and crostini plates. Every night, there is a different gourmet food truck parked in the lot out front (check the website or their Twitter feed for updates on the trucks) and they'll even bring it to you right in the tasting room! The 20/20 deal is normally on Tuesdays, but were extended to Saturdays throughout the month of September. 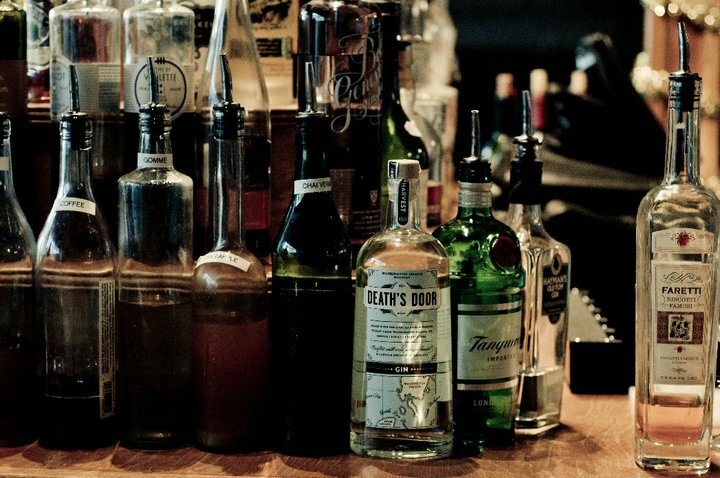 They also do Happy Hour from 5-7 on Sundays, Tuesdays, Wednesdays and Fridays, where wines by the glass are half off and bottles are discounted by 10% in the shop. Monday nights offer special flights and discounts and Tuesdays offer beer flights and ale-friendly snacks. They'll occasionally have live music playing and other nights planned that focus on different kinds of wines or regions. Needless to say, it's a killer deal, fun crowd and the shop has an excellent selection of wines in a range of prices. Libations left over: Make yourself a Manhattan! I heart Manhattans (not as much as Old Fashioneds, but pretty close) and I heart mussels. So when I saw this recipe come through on Tasting Table, I had a serious happy moment. My culinary geeking out was kicked up another notch when I saw the recipe was from Holland House Bar & Refuge in Nashville, Tennessee. I had gone to Nashville last fall for a business trip, and being the lush I am, I quickly found out where all the best cocktail dens were (The Patterson House is another fave). The restaurant/bar is located in an old grocery store in a quiet neighborhood and only opened about a year and a half ago. It was redone to have a classy vintage look with plenty of warm woods, velvet furniture, crystal chandeliers and old books tucked away. The menu is broken down into historical classics and vintage-inspired contemporary cocktails. Food is seasonal and combines French and Southern influences. I ended up doubling this recipe and buying about 2 1/2 pounds of mussels at Santa Monica Seafood because I was making this for a main course. Most of the alcohol burns off with the cooking, but it leaves you with a light Manhattan flavor. The broth was so good that we heated it up again and toasted some more bread to soak it all up! Please note that I used Tasting Table's pic because we devoured the mussels before a lovely photo could be taken, but yeah...it looks like that! - In a medium skillet, warm the olive oil over medium-high heat. - Add the garlic and mussels. - Quickly and carefully add the whiskey, vermouth and bitters because it could flame up. I actually combined the liquor in one bowl so I could add it all in together. - Stir in the vegetable stock and butter. 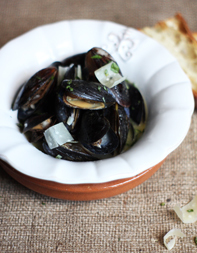 - Simmer until the mussels have opened (4-6 minutes). - Transfer them to a serving bowl and top with cheese and basil. Serve immediately with the toasted bread. Since late February, The Lush Chef has been giving you food and cocktail recipes, libation education, little musings and spotlights on artisanal products, but I haven't told you about where I like to shop in Los Angeles. So let's begin! 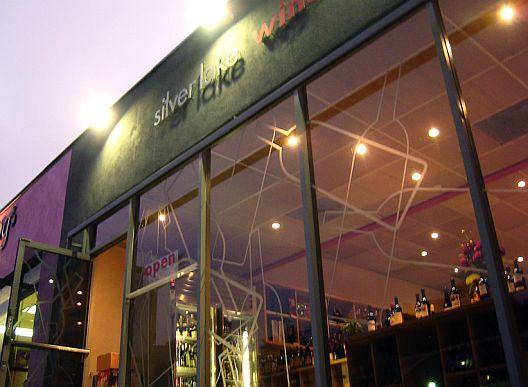 This past weekend, my old boss and I hit up Silver Lake Wine, a hip boutique that offers wines from around the world, some microbrews, select liquors and sake and a few yummy treats from local chefs/bakers. 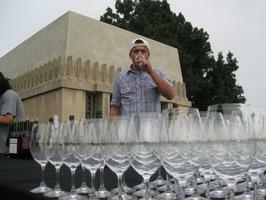 I had my first experience with the shop when I went to the Barnsdall Art Park Friday Wine Tastings this past summer. It's a great event out on the lawn in front of Frank Lloyd Wright's Hollyhock House, with KCRW DJ Dan Wilcox spinning tunes, a flight with four wines and the sun setting over the city. 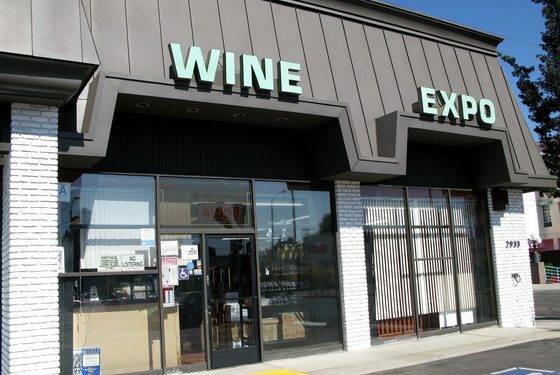 The guys from Silver Lake Wine were young, hip, knowledgeable and just want you to find something you like. My friend highly recommends the Sunday tasting events at 3pm because it's not as crowded and you get delicious food pairings with each glass of wine. Sunday tastings are $20 for 5 wines and food and reservations are recommended—it's an insanely good deal, considering the pours are generous and the food is plentiful. 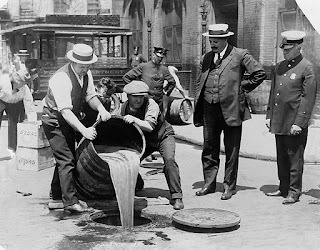 They also do Monday nights with 3 wines, cheese, olives and bread for $12 and Thursdays nights with 3 wines for $12 (the Let's Be Frank hot dog truck is parked outside if you need some nosh). All wines featured in the tasting ended up being 10% off and my friend and I each bought bottles of the Riesling (we liked it because it wasn't very sweet) and the Old Vines (such a smooth red that I couldn't resist). It's not often that I get out to Silver Lake, but it's worth the trek for great wines and beautifully planned tastings. I'll definitely be venturing East again soon. It may not be fall yet, but this Honey Spice Beer Cake from the ladies at Booze Cakes has been on my "to bake" list for a long time. Some friends of mine were doing a housewarming party and weren't planning on making dessert, so The Lush Chef to the rescue! This particular cake is super rich, moist and decadent—as much as I would like to think I could eat a gigantic piece, I could only eat a small one. But oh, what a delicious piece of cake it was! The slightly salty mixed nuts were a nice way to offset the sweetness. The recipe calls for honey beer, but any kind of dark, spicy beer is fine. I had an oatmeal stout on hand and it worked beautifully with this recipe—the flavor was a nice compliment to the lovely mixture of cinnamon, cloves, nutmeg and allspice. I bet this cake would also taste amazing with some pumpkin ale or Guinness, so feel free to get adventurous. - Preheat oven to 325. Grease and flour a 9x13 inch sheet cake pan. - Combine the flour, baking soda, baking powder, salt and spices and set aside. - In a mixing bowl, cream butter and sugars for a few minutes, or until light and fluffy. - Add eggs one at a time, beating after each addition. - Mix in honey, lemon juice and zest. - Mix in flour mixture and beer in 3 alternating additions. - Bake 40-45 minutes. I actually had to bake mine for about an hour because the cake rose like crazy (all that beer!) and took a while to completely bake through. - In a mixing bowl, cream butter with about 1/3 of the confectioners sugar. - Mix in 1 Tbs beer and the rest of the confectioners sugar in alternating additions. If the frosting is looking too thick, keep adding in a little bit more beer. - Stir in the honey. - Once the cake has cooled, frost and garnish with the mixed nuts. - Infuse the tequila - check out my Children of the Sun cocktail recipe if you haven't done this before. - Purée 10 of the strawberries. 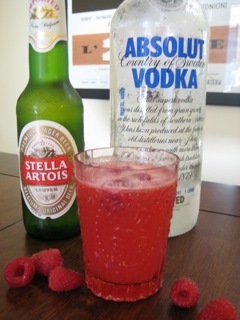 - Combine the tequila, Cointreau, puréed strawberries, lime juice and basil. - Add ice and stir. - Quarter the rest of the strawberries and garnish each drink with a few pieces.